Even with my East Asian descent and I've always called myself to be of the yellow color, I can't deny how I find white girls to be that attractive. My attraction started with Mighty Morphin' Power Rangers followed by Baywatch. I did get shocked to learn Pamela Anderson was really born a brunette though. 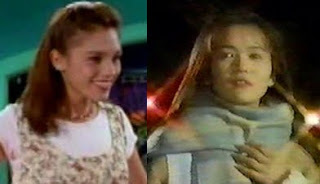 During the later seasons of Mighty Morphin', I was more into Kimberly than Kat so I felt blondes weren't always attractive. More blondes showed up during Power Rangers and I hardly cared about them but other blondes who were attractive caught my attention. While it's true that blondes don't always look better which is evidenced between Hurricanger and Power Rangers Ninja Storm. Tori Hanson was cute (I never considered her pretty) but Nanami Nono is really that hot. I feel most of the Super Sentai women are hotter than their Power Rangers counterparts. Some Japanese women are really that attractive. But I'd still say that attractive people just exist anywhere and it's really a personal preference. The Nanami over Tori scenario is just a small case of my alternate preference. In some cases, an East Asian woman can be as hot as a white woman. I think that case happened during Dairanger and Mighty Morphin' Power Rangers. Rin's hot and Kimberly's hot. I don't deny how both girls are really that attractive in more than one level. There are times Rin makes me forget Kimberly in a glance then the effect happens the other way around. But I guess Rin's actress Natsuki Takahashi is really half-white explaining why she doesn't look so Asian to me. In my case, I still think Kimberly's hotter than Rin but the distance is pretty short... or not. Both aren't really tall either. Skin-quality wise, I think Kimberly's got the advantage. Face-wise, I think both need one's own personal bias in some way to choose. I don't think everyone can agree with me that being Caucasian or for some who think East Asian gives an advantage in hotness. For some strange reason, I think having blonde hair or brown hair with fair skin and blue eyes enhance the attractiveness of an attractive woman. I guess Caucasians find black hair to be attractive and I think brown or blonde hair, fair skin and having brown/blue/green eyes are "enhancers" to physical beauty but that's just me. It's just me okay?